Arrival at Casablanca Mohamed V airport. Welcome, assistance and transfer to the hotel in Casablanca. Check in, dinner and overnight. 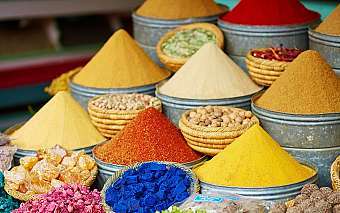 Breakfast and meeting with the tour guide from 9:30am for the sightseeing of Casablanca, the business capital of Morocco. 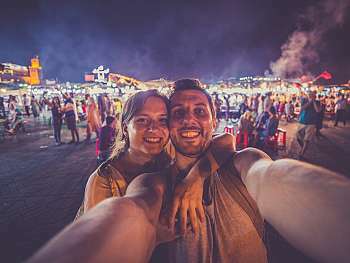 Visit the exterior of the great Hassan II Mosque, Mohamed V square, the United Nations place, the central market, the habbous sector and the residential area of Anfa before strolling along the Aïn Diab coast dotted with swimming pools and restaurants. Independent lunch and departure to Rabat, the white imperial city. 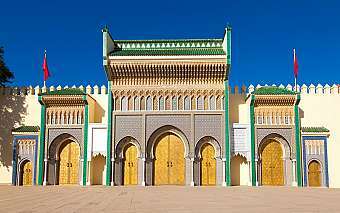 Visit of the administrative capital of Morocco with the Hassan tower, the splendid Mohamed V Mausoleum, the Kasbah of Oudayas and the Medina. Late in the afternoon, check-in at the hotel. Dinner and overnight. After breakfast, departure to Fez with visit of the Roman ruins of Volubilis. Continue to Meknes. 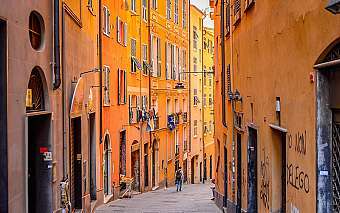 Independent lunch and visit of this city known as « the Moroccan Versailles » which was founded at the end of the 17th Century by Moulay Ismail. 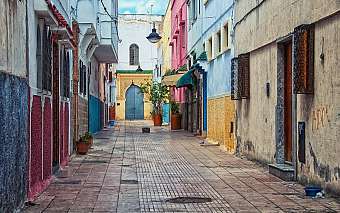 The sightseeing of Meknes will include Bab Mansour, the most preserved gate in Morocco, Hari Souani and the old medina. Arrival to Fez, dinner and overnight at the hotel. 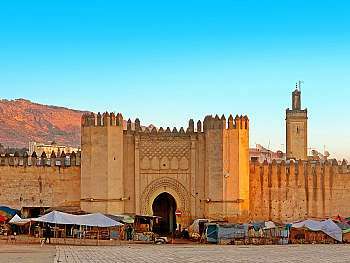 The whole day is devoted to the sightseeing of Fez; the most ancient cultural and spiritual city of Morocco. Visit of the medieval medina, the Medersas, the Karaouine mosque and the famous Nejjarine fountain. 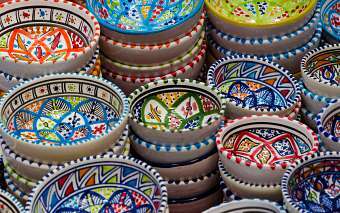 Independent lunch and continuation of the visit through the old medina where the clients will see different craftsmen still operating in the old oriental tradition. Return to the hotel, dinner and overnight. After breakfast, departure to Marrakesh crossing the region the middle Atlas and passing through Immouzer du Kander and Ifrane, a charming ski resort in the heart of a magnificent cedar forest. Stop at Beni-Mellal to enjoy a moment of relaxation. Independent lunch and continuation to Marrakesh. Little by little will appear the red earth of the country contrasting with the clear blue sky and the eternal green palms. Check-in at the hotel, dinner and overnight. 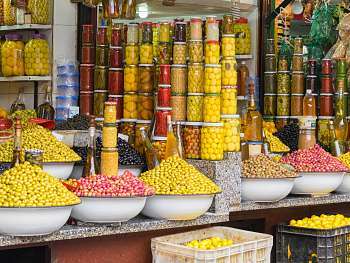 The entire day will be spent visiting Marrakesh, the second oldest imperial city known as the « Pearl of the South» with the Saadian tombs, the Koutoubia, the Bahia Palace and the Menara gardens. Return to the hotel for lunch. 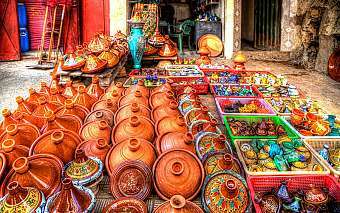 In the afternoon, visit of the souks, the winding little streets and the Djemaâ El Fna place with its various and non-stop entertainment: storytellers, snake charmers, fire-eaters and more. Overnight at the hotel. Optional: A Diffa Fantasia dinner will be served under caïdal tents at the famous «Chez Ali» restaurant while enjoying fantasia performance with camel and horses shows, folkloric and belly dancers. After breakfast, morning free at leisure for a final plunge into the atmosphere of Marrakesh or relaxation by the pool of the hotel. Independent lunch. In the afternoon, departure to Casablanca. Arrival at the hotel, check-in. Dinner and overnight. 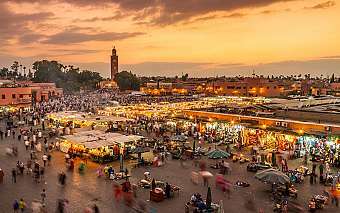 Last night of the tour can be used in Marrakesh instead of Casablanca without supplement.